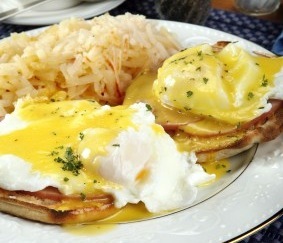 Eggs Benedict is possibly my favorite breakfast or brunch recipe. The mix of poached eggs, toasted English muffin and ham is wonderful together. With the addition of Hollandaise sauce, it’s all pulled together in one glorious taste sensation. Brown ham slices or Canadian or peameal bacon in skillet over medium heat. Split English muffins in half. Toast and butter lightly. To poach the eggs, bring a saucepan of water to a boil. 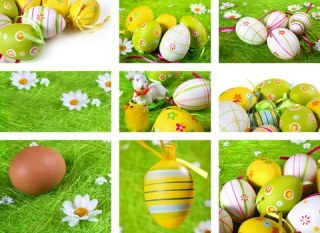 Turn the heat to low, gently add the eggs one by one, ensuring the yolks do not break. Let water gently heat the eggs to desired doneness. Gently lift each egg out of the water with a slotted spoon and place on an English muffin half. Arrange ham on top of muffins. Top each with a poached egg. Peameal bacon is a Canadian phenomenon. It is an uncured bacon that has been rolled in corn meal. Slice it into 1/8″ slices, fry as bacon and use in place of the ham. It is quite delicious. Eggs benedict may seem like a difficult or gourmet breakfast recipe, but it is really quite simple. Just add a few quick ingredients to poached eggs and you are ready to go. Of course you can get a package of powdered hollandaise sauce mix, and it is tasty, but if you want the real thing, look at our recipe for hollandaise sauce. It is not too difficult or time consuming to make it yourself. Find our all of our breakfast recipes here. Originally posted by Talia from BC.